That quote, found halfway down page one of Chapter One in Why Don’t Students Like School? : A Cognitive Scientist Answers Questions About How the Mind Works and What It Means for the Classroom, took my breath away. So simple, so straightforward — and so paradigm-shifting. I’ve thought a lot about the multitude of reasons many boys struggle in school, but I’d never given considered the question from a neuroscience perspective. Dr. Willingham, on the other hand, has given a lot of thought to how the brain works. He’s a Harvard-educated cognitive psychologist at the University of Virginia; up until the year 2000 or so, all of his research focused on how the brain learns and remembers. For the last 16 years, he’s dedicated himself to bridging the gap between research findings and practical applications. In other words, he now spends his time and energy helping teachers figure out how to best apply the insights of cognitive psychology — what we know about the brain and how it works — to teaching. It’s not unusual to see kids who love learning, who are curious and like discovering new information, problem solving and creating, yet they hate school and they don’t thrive there at all. Often they’re viewed as “troublemakers” or “lazy.” What’s the disconnect there? It’s very difficult to say. One thing that makes me uncomfortable is I feel like a lot of times when kids are like that — and everyone knows a few kids like that — I feel like teachers very frequently end up getting blamed for that. That educators are somehow making school boring. This stems from the idea that it’s natural to love learning, but school quashes that flame of curiosity and creativity, which I’ve I don’t think is right. Yes, very young children are very curious, but curiosity sort of naturally dies away for the most part once you’ve learned about your world. Once your world is predictable there’s much less reason to be curious, and then curiosity turns into something that appears under certain circumstances. So there are lots of reasons that kids might find school is just not for them. For some of them, it’s hard to be in an environment where you don’t get to do what you want to do, where you’re supposed to follow the curriculum. That said, I think there’s a good reason to have a curriculum not just let kids pursue their interests. For some kids, being in the social situation [of school] is very difficult. At school, they’re in forced contact with lots of kids and [if] they’re not succeeding socially, it’s not an easy time. That sort of bleeds over into their entire school experience. So the question of why don’t students like school — I sort of admitted [in the book] that I was actually talking about a very narrow aspect of the problem, which is the difficulty of getting a classroom of students interested in a problem or concept. Generally speaking there are more boys who don’t like school than girls. Why do you think that is? I wouldn’t venture to answer that question because I’m sure there is substantive research on the topic and I don’t know that research. I don’t have the background to answer that. Teachers want to do what’s best for their students. What are some resources teachers can consult to learn about the latest advances in learning sciences, and to apply those things to their instruction? Education has something in common with many other professional fields, which is you go and get your training, and then you go out in the field and are practicing but research is still on-going, so what you learned in school is getting outdated. For most education specialties — say mathematics or English language arts or history — there are organizations of professionals within that domain. Many of those organizations are especially good about bringing new research to the attention of their members. 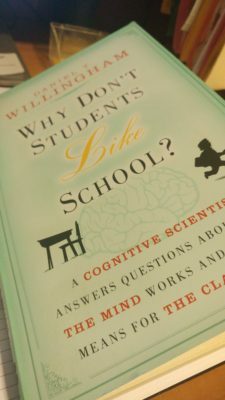 Dr. Willingham’s book, Why Don’t Students Like School? : A Cognitive Scientist Answers Questions About How the Mind Works and What it Means for the Classroom, is January’s BuildingBoys Book Club pick. His other books include Raising Kids Who Read: What Parents and Teachers Can Do and When Can You Trust the Experts? : How to Tell Good Science from Bad in Education. Follow him on Twitter @DTWillingham. Have more questions about boys & school? Check out our FREE webinar, Help! My Son Hates School!